Well, it probably won't, but it couldn't hurt. 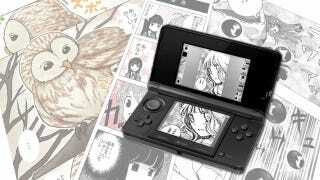 This is Comic Koubou (コミック工房 Comic Workshop), a new 3DS download-only app for easy manga creation. It's obviously not as high-end as software like Manga Studio or Clip Studio Paint, and you probably won't see a lot of published manga artists releasing pieces they drew on their 3DSs, but for light-hearted sample of what the process is like, it doesn't look so bad. The software allows for the basics – free panel division, basic tools for speech and text bubbles, vertical and horizontal text placement, pens, brushes, and tones – as well as digital platform benefits like layers (up to 5 simultaneously), copy/paste, and the ever essential undo/redo function. Manga created in Comic Koubou can be saved in a JPEG format to the 3DS SD memory card and can transferred to PC or uploaded to the internet. Although it's being released on the 3DS, the software does not support 3D display. Pages also have a maximum size setting of 896 x 896 pixels, which is obviously far under the preferred size for heavy hitters, but then again, heavy hitters probably already have their own preferred software. Comic Koubou is on the light end of the spectrum when it comes to image creation software, but it does make relatively good use of the hardware. Touch panel technology is definitely the way to go for drawing programs, but still, it woulda been nicer if they'd release it on the Wii U. Comic Koubou is scheduled for release on the Japanese Nintendo eShop on January 15th for ￥800 (US$7.62). No word on an international release.